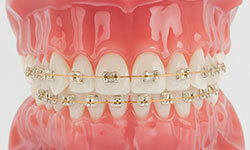 Have you ever wondered if braces today are the same as they used to be back in the day? Well, the answer is that while braces are still the most common way orthodontists straighten teeth and align bites, the styles and shapes of braces have come a long way! Check out the different styles that Dr. Mack and Dr. Hansen use in our Longview office. 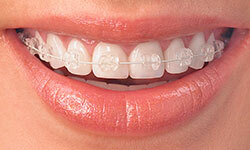 Our modern metal braces are the most common type of braces we use and are more comfortable today than ever before. 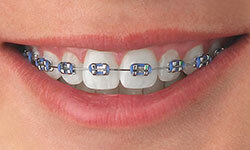 Made of high-grade stainless steel, our metal braces straighten your teeth using metal brackets and archwires. As with all our types of braces, you have the option of adding colored elastics (rubber bands) for a more unique and colorful smile. To learn more request a complimentary consult today! Our ceramic braces are made of clear materials and are therefore less visible on your teeth than metal braces. All of our patients who choose this option absolutely LOVE these braces, especially adults and older teenagers because they are so much less visible. To learn more request a complimentary consult today! Clear aligners such as Invisalign are a series of invisible, removable, and comfortable trays that straighten your teeth like braces. Not only are the aligners invisible, they are removable, so you can eat and drink what you want while in treatment, plus brushing and flossing are less of a hassle. The aligners are comfortable and have no metal to cause mouth abrasions during treatment. These braces provide a unique blend of functionality and style that can't be found anywhere else in East Texas. To learn more request a complimentary consult today!